Power Manager 4.1 and Power Manager Professional 4.1 are now available. This is a significant update introducing a new event editor, more assistants, and bug fixes. As always, we recommend all users update. Bug: Fixed bugs for Mac OS X 10.7 Developer Preview. Bug: Fixed event view icon invertion when not window is not key. Bug: Fixed potential pmd crash when changing time zones (Mac OS X 10.5). Bug: Fixed pmuli login items set up bug (Mac OS X 10.4). Refined: Improved self-signed certificate creation and management. Refined: Any executable file can now be added to conditional running processes list. Refined: Added certtool example to the Administrator Guide. 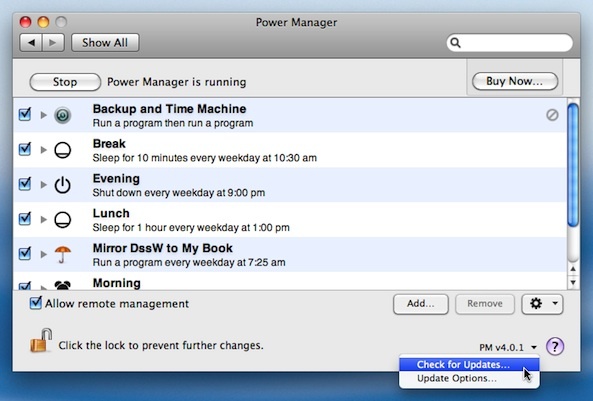 Refined: Added version information to Power Manager helpbook. Refined: Improved licence entry sheet (Pro). Refined: Status menu differentiates a stopped scheduler and no pending events. Refined: Removed extraneous menu item in status menu when only on-demand events are scheduled. Refined: Removed pmrights tool. Added functionality to pmd. Refined: Added ability to repair required authorization rights on pmd launch. Refined: Added ability to install to non-booted System volumes. Refined: Improved remaining non-essential installer scripts. Refined: Added ability to opening multiple events from an event view. This article was posted in PM4, PMPRO4, and Power Manager and tagged Power Manager, Power Manager Professional, and software update.